Citation: Doran, Christine, et al. 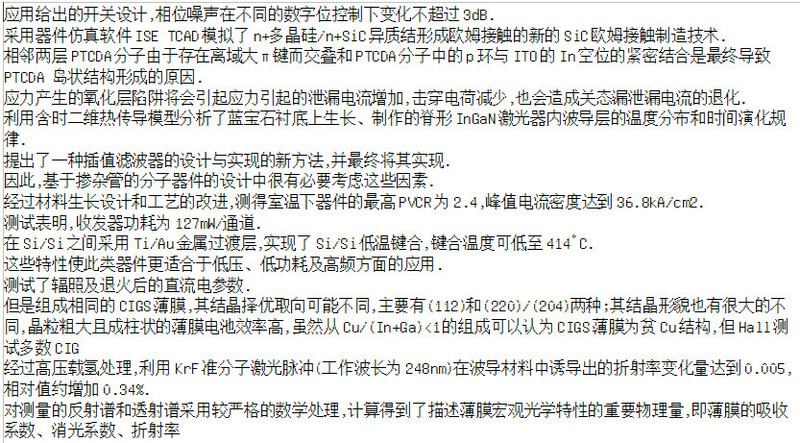 Chinese-English Semiconductor Parallel Text LDC2012T22. Web Download. Philadelphia: Linguistic Data Consortium, 2012. Chinese-English Semiconductor Parallel Text was developed by The MITRE Corporation. It consists of parallel sentences from a collection of abstracts from scientific articles on semiconductors published in Mandarin and translated into English by translators with particular expertise in the technical area. Translators were instructed to err on the side of literal translation if required, but to maintain the technical writing style of the source and to make the resulting English as natural as possible. The translators followed specific guidelines for translation, and those are included in this distribution. There are 2,169 lines of parallel Mandarin and English, with a total of 125,302 characters of Mandarin and 64,851 words of English, presented in a separate UTF-8 plain text file for each language. The sentences were translated in sequential order and presented in a scrambled order, such that parallel sentences at identical line numbers are translations. For example, the 31st line of the English file is a translation of the 31st line of the Mandarin file. The original line sequence is not provided. Follow these links for Chinese and English samples.